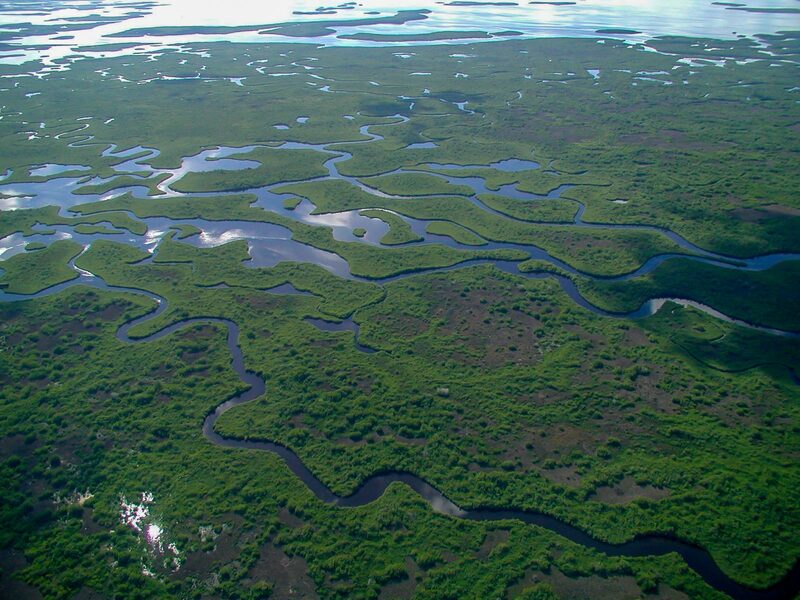 In 1940, conservationist Marjory Stoneman Douglas termed Everglades National Park, a 1.5 million acre wetlands expanse, the “River of Grass.” Much of the park is sawgrass prairie, where a freshwater slough flows slowly through marsh and sawgrass, to the Gulf. Hammocks and bayheads are points of elevation that shelter cypress, mahogany, and palm trees. The weather is best from November to mid-April; hurricane season is from June to October. When setting off by car for a day of exploration, be sure to have a full gas tank, as there is only one gas station in the park, at Flamingo Visitor Center. As it is primarily for boats, the price is at a premium. The park has four visitor centers. The Ernest V. Coe Visitor Center is most proximal to Miami, in Homestead, and accesses many walking trails over the marshes, on wooden walking decks, and others within the wooded hammocks. Long Pine Key campground is also near the Homestead entrance. A tram tour, with abundant sightings of alligators and birds, is available via the Shark Valley Visitor Center, to the north. 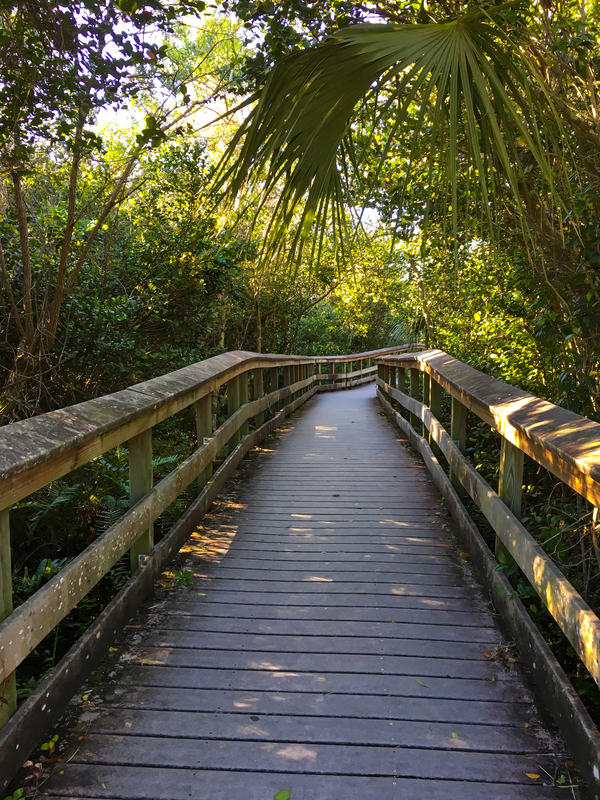 Gulf Coast Visitor Center, to the west, is a coastal mangrove and saltwater gateway — this area is ideally explored by boat, and rental and tour opportunities are available within the park. Flamingo Visitor Center is the southernmost point in mainland Florida, and a good spot for supplies, camping, and tranquil coastal vistas. Along the Mahogany Hammock Trail, Everglades National Park. Photo by Derek Wright. Everglades National Park is approximately one hour southwest of Miami International Airport (MIA). Flying into Fort Lauderdale (FLL) adds about 20 minutes of driving, and, depending on the time of year, may allow for better rental car and flight options. Primary carriers to the region are American Airlines, Delta, and JetBlue. We recommend, however, flying either into or out of Key West, to allow for a visit to Dry Tortugas National Park. (Our weeklong itinerary, detailed below, brings you to Everglades, Dry Tortugas, and Biscayne National Parks.) This would involve booking a one-way car rental, and the other flight through FLL or MIA. Run potential itineraries through both airports, to compare price. Often, one-way car rentals are less expensive from Key West heading northbound than the reverse, and Delta and American offer regular service to Key West. Shuttle buses from FLL and MIA to the Keys are an option, and run about $100 per person round trip. If considering hotel lodging, Homestead posits one closer to Key West and Dry Tortugas; Homestead is a quieter town of shopping centers, gas stations, and some excellent Mexican and Latin American cuisine. It’s 30-45 minutes back to Miami proper from here, and quite proximal to Biscayne National Park. The Suggested Itineraries section offers a few ways of fitting these possibilities together in a weeklong trip. Hilton, IHG, and Marriott all have lower tier redemption hotels in the area. Travel Note: Florida’s Turnpike Extension (FTE) has introduced an all-electronic toll system; there are no physical cash tollbooths on the Turnpike between Milepost 0 in Florida City and Milepost 47 at the Miami-Dade/Broward County line. This will incur the toll usage fee on your rental car. 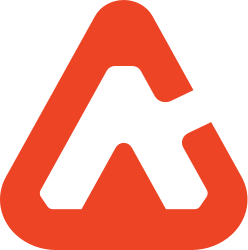 For some rental companies, this usage fee is applied to the full rental term on a daily basis, and not solely on the days when you use the service. You can take local roads to avoid the Turnpike, though it can add 20-30 minutes one way from MIA to the Keys, on to what is already a lengthy road trip, especially if there are the all too common traffic backups in the Keys. The main park road outside of the Ernest F. Coe Visitor Center is a good beginning point, especially if lodging in Miami or Homestead. 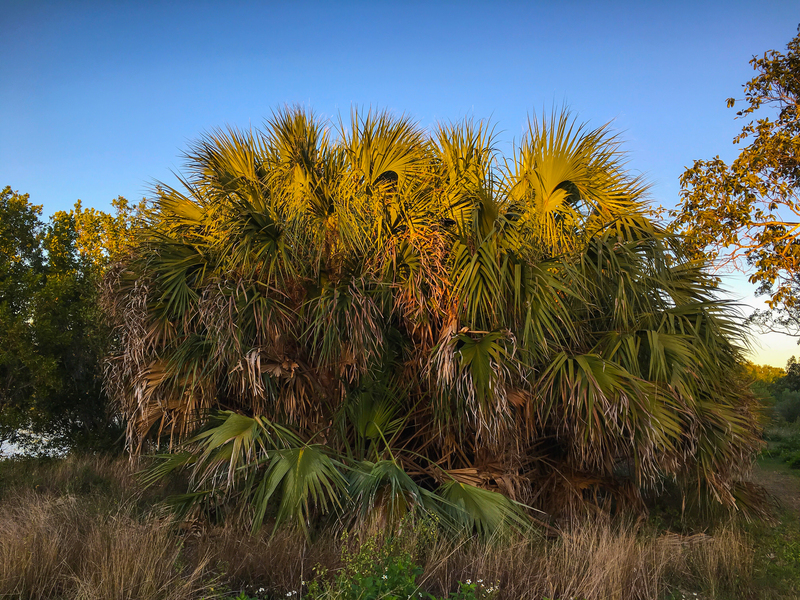 Royal Palm, a short distance from the Visitor Center, accesses the Anhinga and The Gumbo Limbo Trails; walking decks on the Anhinga weave quietly over a freshwater sawgrass marsh. Here one might spot heron, egret, and cormorant, as well as alligators and turtles. The Gumbo Limbo Trail moves through a hard wood hammock, where the red-barked Gumbo Limbo tree thrives. 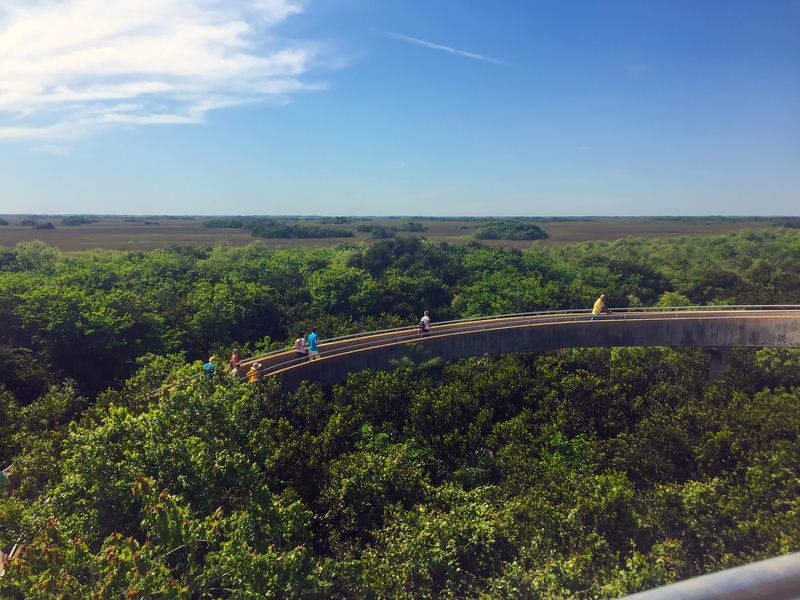 Also along the main park road, The Pa-hay-okee Overlook meanders through a boardwalk and a hammock of Bald Cypress, to a nearby overlook of freshwater marl prairie and the Shark River Slough, which courses through the Everglades and empties into the Gulf Coast. Mahogany Hammock nestles mahogany and cypress, and is a quiet, forested walk. The Flamingo Visitor Center is thirty-eight miles south from Coe Visitor Center; campgrounds are available, as is boat, kayak, or canoe rental, for exploring the multiplicity of keys dotting the Florida Bay. Some tour companies will drop off and pick up on the trails, so you don’t have to paddle both ways. On Day 2, or when you are ready for the next leg, take US 41 north, to the Shark Valley Visitor Center. US 41 is also called the Tamiami Trail, and as you head west, shopping centers and gas stations become more sparse, and the road is lined with cypress. A $25 (as of 2017) tram tour of this quarter of the park is two hours long, and offers some of the best opportunities for observing wildlife, as well as vantage on the glades from a 65-foot high observation deck. We visited Shark Valley during a dry season that was atypically wet, and still spotted Great Blue Heron, Great Egret, a Red-shouldered Hawk, Killdeer (a brown, black and white plover), a male Anhinga, soft shell turtles, alligators, and many varieties of butterflies; Water dropwort, Morning Glories, and Arrowhead flowers bloom along the edges of the sawgrass prairie. Call Shark Valley Tram Tours for a reservation if taking the tram tour midday, as it can fill, and arrive well ahead of time to secure parking; during the high season, when the parking lot is full, arriving cars will only be allowed in as others depart. We recommend taking an early tour, both to beat the midday crowds, the heat and to allow time for an afternoon excursion. Bring binoculars! Shark Valley overlook, photo by Amy Beth Wright. With a good start to the day, time will permit for an afternoon excursion, and Big Cypress National Preserve, a 729,000 acre freshwater wetlands region, is forty minutes further west on US 41 from Shark Valley; the Oasis Visitor Center is only a twenty minute drive, and offers a quick promenade over a marsh where alligators sunbathe and swim just below — this spot is the closest we have ever come to these creatures. The second closest is on Loop Road, which is great for exploring Big Cypress. The road is one-lane, and mostly gravel in some places. It’s well worth the 45 minute drive (longer with stops) as you’ll get to experience the diverse ecology of the preserve (and see lots of wildlife and few people.) The fist half is the gravel part, and is much more interesting than the paved section. 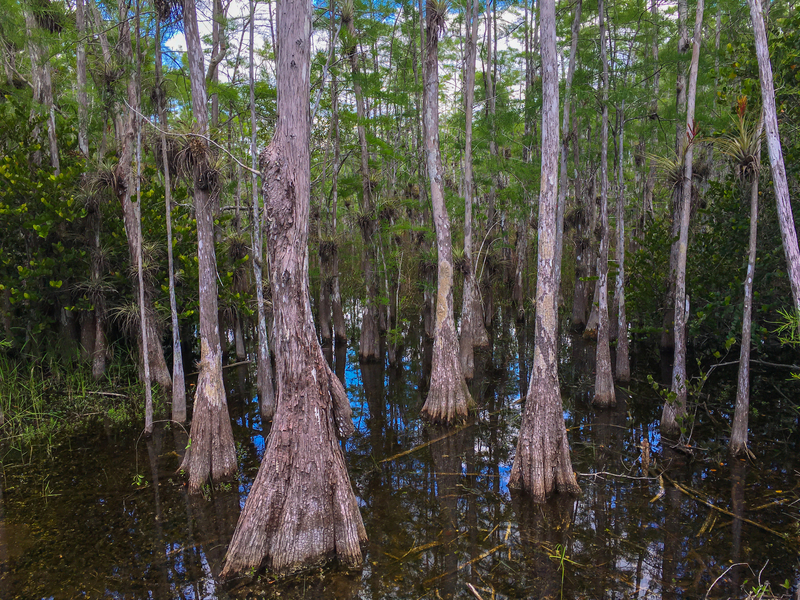 Cypress trees along the Loop Road, Big Cypress National Preserve, photo by Derek Wright. You might also proceed to Gulf Coast Visitor Center, an approximate 50-minute drive west of Shark Valley; a very early start might render all three stops possible. If exploring the western side of the park, we might suggest checking out of your lodgings in Homestead or Miami as you begin Day 2, and ending the day in Naples or Fort Myers, to situate you closer to Gulf Coast Visitor Center for Day 3. Naples is about 40 minutes north of the Gulf Coast Visitor Center, via US 41. IHG’s Holiday Inn Express is a good option that offers a complimentary breakfast. For a bit of luxury, Marco Island is also proximal, and there are several high end Marriott properties there. This is a good time to consider using Marriott points, as cash prices for rooms are often at a premium. Regardless of when you arrive at Gulf Coast Visitor Center, on Day 2 or Day 3, plan to get on a boat! Rentals and tours can be secured within the park through concessionaires. 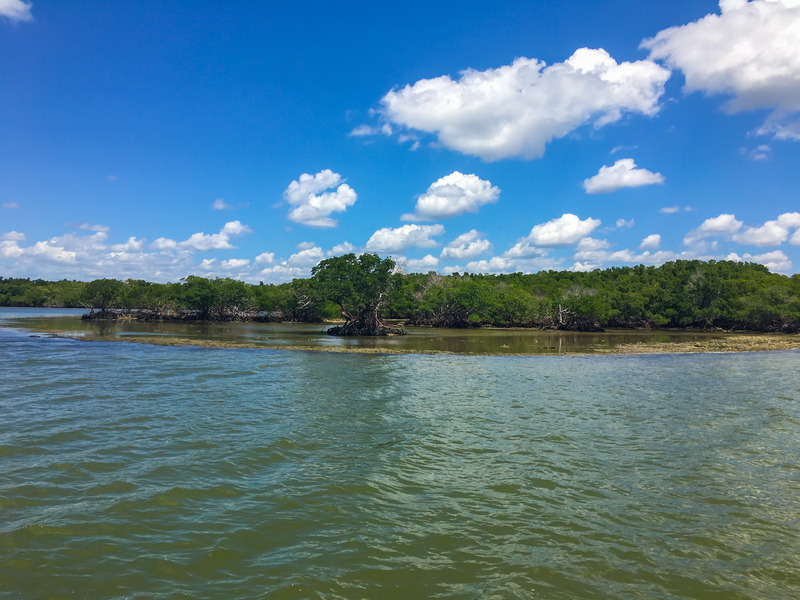 It’s the only way to really see this part of the park, which is comprised of 10,000 islands, and you’ll once again be rewarded with lots of wildlife sightings, on our tour this included matinees and dolphins. Keys in the Thousand Islands, Everglades National Park. Photo by Derek Wright. 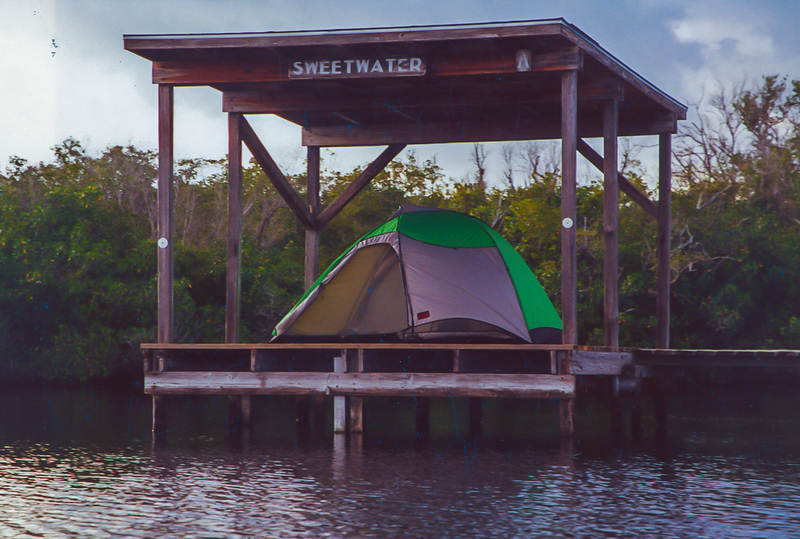 If you are interested in camping, Everglades NP is a great place to do so! Though due to the weather (heat, rain and possible hurricanes) along with mosquitos, we can’t recommend tent camping in summer—perhaps keep tent camping trips to early November to late March. Everglades has two main campgrounds, Long Pine and Flamingo. Long Pine is located a few miles inside the park from the Earnest F. Coe/Homestead entry and features over 100 drive up sites for both tents and RV’s. Long Pine does not accept reservations, so it is first come first served, though it rarely fills. If you’d like to guarantee a site, book Flamingo, as there are nearly 300 sites available and half are reservable. A wide variety of sites exist at Flamingo, from RV to drive-in to walk-in including some on the beach! Be certain to make reservations, as Flamingo can fill quickly in the winter months due to its proximity to the water and the views of the bay. During the winter season, half of the sites are always kept for walk-ups without reservations, which is helpful. If you want to do backcountry camping, you’ll really want to read up first. You should first visit the official NPS site for comprehensive info and also feel free to call either visitor center to talk to a ranger. There’s a lot of opportunity to backcountry camp, everything from chickees, which are elevated wooden platforms in the rivers, to beach camping. Originally made of palm or palmetto thatching on a raised floor, chickee platforms have been adapted from Seminole dwellings in the Everglades. Do note that almost all backcountry camping sites require paddling or boating in. There is one hike-in site, Clubhouse Beach, which can be reached via the Coastal Prairie trail, a difficult and uncomfortable 9 mile hike through mud, sun and insects; best to rent a kayak or canoe. Palms in Everglades National Park, photo by Derek Wright. Be prepared before heading out—there is no freshwater available at any site and in some cases only gas stoves are permitted. Take good nautical charts and be prepared for what can be rather significant tides. Thankfully many of the sites include a portable toilet. Note that many of the sites do not allow for staking of tents. 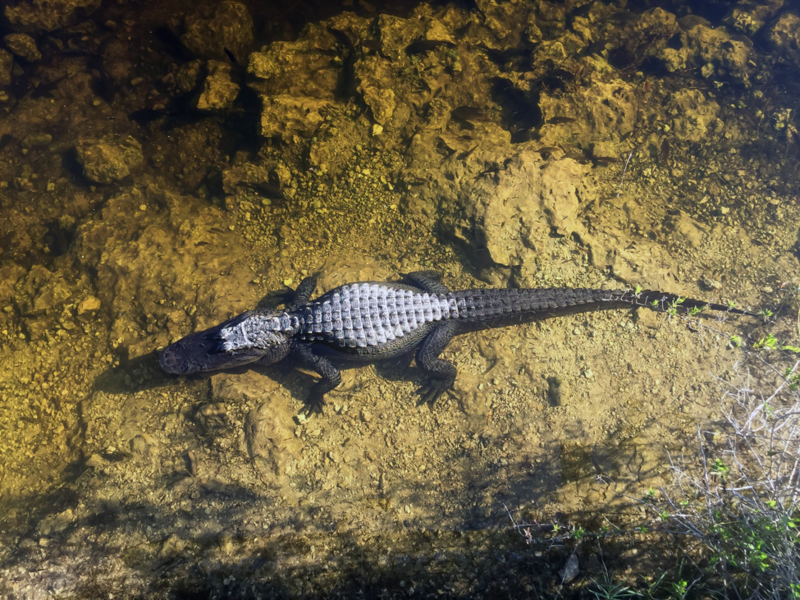 Chickee, Everglades National Park, photo courtesy Everglades National Park. Note that advance reservations are not taken for the backcountry sites, if you’re set on camping for a night in a specific location, check in with the rangers one night in advance and always have a few additional options in mind. Again, booking your original car rental from MIA or FLL as a one way rental affords some interesting options; you could fly home from Fort Myers (RSW), or take the ferry service to Key West from either Fort Myers (daily) or Marco Island (seasonal.) You could also opt to return to Homestead or the Miami area after touring the Gulf Coast side of the park, traveling leisurely on US 41, or zipping back on I-75 which leads directly to FLL and MIA. If you then drive to Key West from Miami or Homestead, perhaps stop overnight along the way south, as there are many options within the keys, and one night in season on Key West can be pricey, whether using money or points. 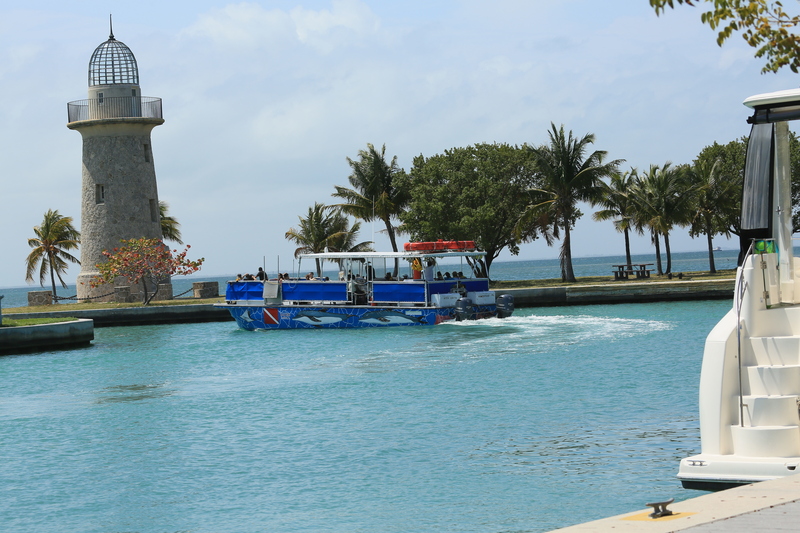 Biscayne National Park boat tour, photo by Bruce Tuten / CC BY. Biscayne National Park is south of Miami and east of Everglades National Park. A quick Visitor Center stop on your way south to Key West via car is possible, but better to allocate a whole day as touring happens on the water via kayak or canoe trip (guided available). Basic boat tours are about $30 per person. A more complex tour including snorkeling and sailing is about $150. Dry Tortugas National Park is only accessible via concessionaire boat or seaplane from leaving from Key West. Boats depart early in the AM, so do check the schedule, the total cost is approximately $175 per person for a full day tour. The park entry fee is included in the tour cost and is refundable if you show your National Parks Annual or Lifetime pass. A seaplane (!) will cost in the neighborhood of $325 per person for a half-day adventure. You can camp on Dry Tortugas, but if doing so, definitely plan for the concessionaire boat, as the seaplane will not take campers. It would be primitive camping, and you’ll need to pack in everything — there’s no potable water in the park, so plan ahead! Also, if camping arrive early for the boat, as once approximately ten people’s camping gear are aboard the ship, the ship’s cargo hold is considered full. You must have a tent to camp at the Park but reservations are not required. 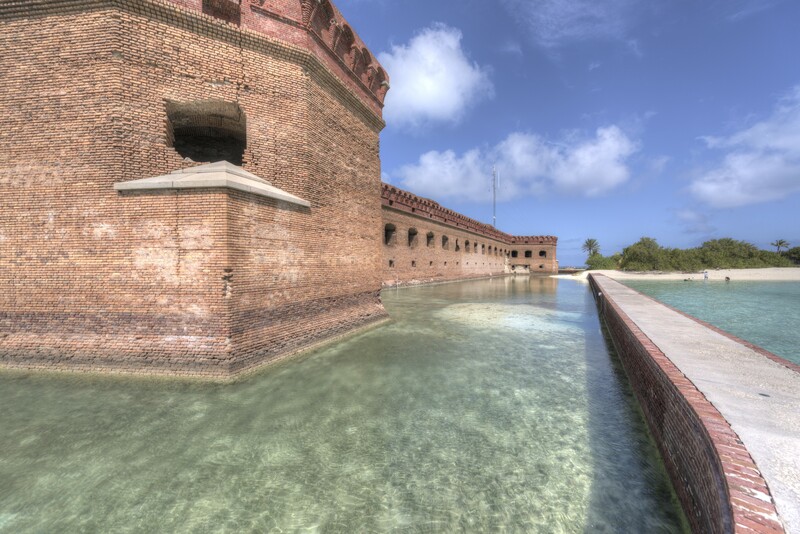 Dry Tortugas/Fort Jefferson, photo by Russell Conard. Day 1 – Arrive Ft Myers. Spend the evening in Naples or Marco Island. Travel Note: Lastly, as we are talking about Southern Florida, consider keeping a rain day available to swap with Miami’s indoor sites and sounds. 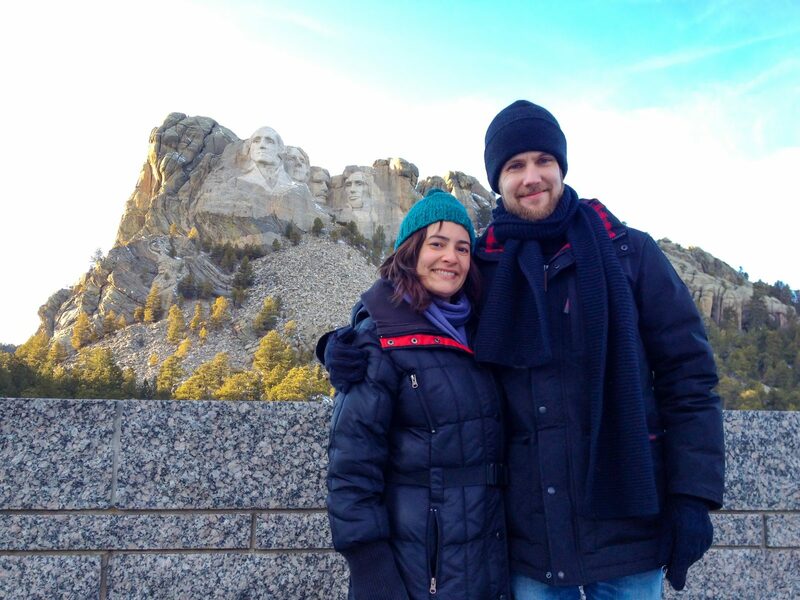 Amy Beth and Derek Wright are Brooklyn-based writers with a great appreciation for shared public lands. In addition, the Wrights believe that travel can and should be accessible to all, and enjoy posting timely opportunities to book affordable travel, throughout the year. Parks and Points also hosts and annual fall essay contest and a spring poetry series in conjunction with National Poetry Month. This entry was posted in Activities, Biscayne, Camping, Campstake Guides, Dry Tortugas, Everglades, Fishing, Florida, Hiking, National Parks, Sightseeing, States, Swimming, Water Sports, Wildlife Viewing. Bookmark the permalink.